FAYETTEVILLE, Ark. 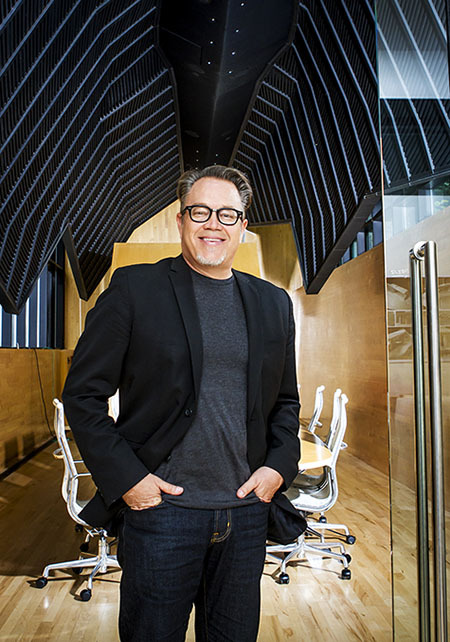 – The Fay Jones School of Architecture has announced Marlon Blackwell as the 2015-2018 E. Fay Jones Chair in Architecture. Blackwell’s selection was announced Jan. 30 during a schoolwide celebration of Fay Jones’ birthday, which was officially Jan. 31. Blackwell, a Fellow of the American Institute of Architects and a Distinguished Professor, began his teaching career at the University of Arkansas in 1992. He has served as the head of the Department of Architecture since 2009, and his term ends after this spring semester. Although, he said, he didn’t set out to get into administration. When asked to serve, Blackwell took on the challenge. And, in the past six years of leadership, he feels he has accomplished several things. He has developed a stronger direction for architecture curriculum at every year level, particularly in the professional degree program. He’s guided and encouraged the collaboration between the architecture, landscape architecture and interior design programs to create a combined studio for first-year design students. Blackwell also has looked for opportunities to empower the architecture faculty to pursue their own research interests and to create research opportunities for the faculty and students alike. He has worked to strengthen the relationship with the school’s Community Design Center and to develop relationships with outside organizations and institutions, often in the form of the design/build program and fifth-year studio projects that involve civic engagement. In the last six years, Blackwell has held visiting professorships at three other institutions: the University of Michigan, the University of Virginia and Cornell University. That allowed him to represent the Fay Jones School in other contexts and also aided his ambition to elevate the status of the school at a national level. Through these and other associations, he forged connections that led to bringing in esteemed academics and practitioners for reviews of student work and reviews of the architecture curriculum, and visiting John G. Williams Distinguished Professors, while also building a network of advocates for students once they graduate, whether they pursue graduate school or positions in design firms. 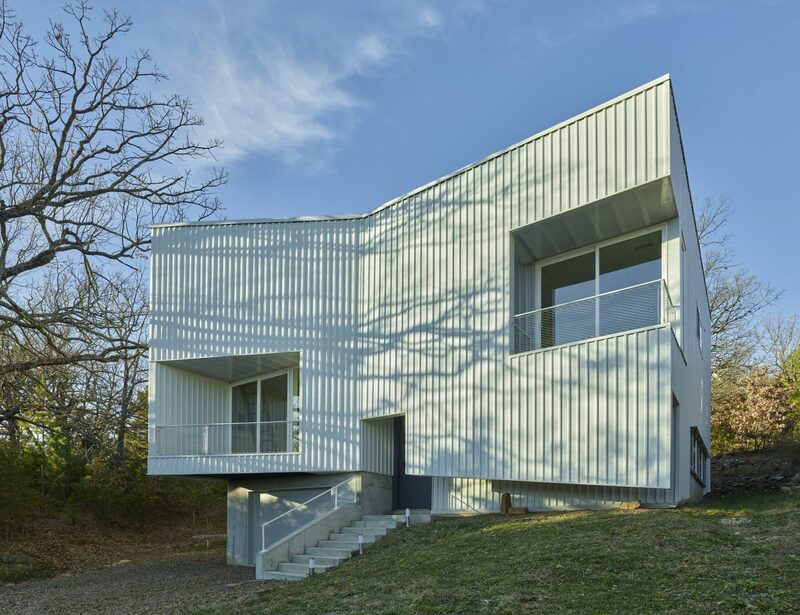 With his professional practice, Marlon Blackwell Architects, he has won numerous national and international design awards, including four Institute Honor Awards from the American Institute of Architects in 2012-2015 and top Civic and Community Building in the 2011 World Architecture Festival. Blackwell has also received many accolades for his academic and professional work. DesignIntelligence named him as one of “30 Most Admired Educators” for 2015. In 2014, he was selected as a USA Ford Fellow, receiving a $50,000 fellowship grant from United States Artists in the Architecture and Design category. He received the Arts and Letters Award in Architecture from the American Academy of Arts and Letters in 2012. Then came the latest, the E. Fay Jones Chair in Architecture, which is supported by the Don and Ellen Edmondson Endowment. It provides funding for a faculty member who is “nationally respected in the field of architecture, supplying the resources required to build upon and enhance the scholar’s contribution to teaching, research and public service.” In addition, this chair position will promote the contribution of Jones through the discipline of architecture and to cultural attitudes toward design quality. Past holders of this position include David Buege, a professor of architecture in the Fay Jones School, and Lawrence Scarpa, of Brooks + Scarpa Architects in Los Angeles. Blackwell said that he is humbled to step into this role, as he also leaves behind his administrative role and returns his sole focus in the school to being an architecture faculty member. Though their design styles are different, Blackwell always appreciated Jones’ design philosophy, his integrity and his accessibility as a friend and a mentor. In Jones’ later years, Blackwell recalls asking him how he was able to sustain such a consistent practice of great work for so long. Jones told him that he decided to start his practice the way he wanted to end it, with a drive and fervor for architecture at the highest level from the start.